Office Chairs Unlimited carries a large selection of quality made height adjustable activity tables in a variety of shapes and sizes to help match any office decor. 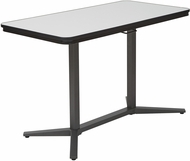 Please browse our height adjustable activity tables and sit-stand desks listed below. When you're ready to order, keep in mind that we offer our low price guarantee and free shipping on every table that we sell.